Indigenous education is becoming a greater priority amongst educators and the Canadian government, following calls to action from the Truth and Reconciliation Commission of Canada (TRC). The TRC calls to action asks the federal government to implement a new legislation regarding indigenous education with the full inclusion and consent of indigenous peoples. The TRC first released these calls to action in 2015, which reinforced many high schools across the country to include the history of residential schools in their curriculum. Some of the other demands include improving education and student success rates, creation of a culturally appropriate educational program, to preserve indigenous language by offering language classes as a credit course and valuing and recognizing Treaty relationships. Concordia University is responding to these calls to action. On Nov. 2, the university announced the appointment of two special advisors to the provost on Indigenous directions, Charmaine Lyn and Elizabeth Fast. Lyn said she and Fast are spearheading Concordia’s response to the Truth and Reconciliation Commission’s calls to action. “This is kind of an expansion of some of the work that I’ve been doing at our faculty level,” said Fast, as she was originally just an associate professor for applied human sciences before being offered this position. “Essentially over the next three years we’re hoping to explore, identify and recommend priority areas,” said Fast. She said currently she and Lyn are in the process of creating a leadership group to assemble and help guide them in identifying what the university should be focusing on in terms of indigenous representation. “A lot of things are still unknown right now, but we really hope to set up a process with indigenous leadership in order to help guide us, including faculty, staff, students and elders,” said Lyn. She said they are seeking improvement on indigenous student support across the university and increasing the amount of and degree to which all educators include indigenous perspectives in their courses—not only in regards to content, but in the ways and lenses these histories are taught. “Everything is going to be including the [indigenous] leadership team, but Charmaine and I really have the mandate to coordinate and move on things that the leadership team is identifying and recommending to us,” said Fast. Along with the hiring of these advisors, the university will soon release an online indigenous hub on Concordia’s website which will provide an online environment for communication. The appointing of these special advisors was initiated through the First Peoples Studies Member Association meeting with Concordia president Alan Shepard. Shiann Wahéhshon Whitebean—president of the First Peoples Studies Member Association and founder and main organizer of the Indigenous Student Council at Concordia—was involved in the push for this change. Whitebean is also a part of an indigenous Concordia working group, to which she said the group initiated in response to the TRC’s suggestions. Faculty, alumni, staff and students came together across campus to address their common concerns over the lack of indigenous immanence on campus. “We were really working together to push administration to push indigenous engagement initiatives in the strategic planning,” said Whitebean. Whitebean said she was invited by Fast to join the Truth and Reconciliation Leadership Group. “I know from my part I would be able to just contribute my perspective and my experience as an Onkwehón:we:* person,” said Whitebean. She said, with this position, she will make sure student voices are part of these student initiatives moving forward. She said she sees the hiring of Lyn and Fast as a positive move. “It definitely demonstrates the commitment of Concordia as an institution and the administration to really engage with indigenous initiatives and people,” said Whitebean. Hele said he would like to see concrete action made by the university, beginning with financial support. He said the university should support First Peoples Studies financially and all First Peoples on campus. In terms of the university funding First Peoples Studies, Hele said this includes funding resources, awards, research, elders involved, mentors and tenure stream hires. Hele said he has heard the university and the Faculty of Arts and Science treats First Peoples Studies equally with all other programs and departments. “Problem is when you have a program that starts from a lesser unequal footing and then reduce it, the faculty and university is reinforcing inequality masquerading as equality,” said Hele. Concordia needs to realize it will take time and money to create indigenous presence and resources on campus, said Hele. However, he is doubtful the university will spend much time and money on this. “Hopefully the committee is more than an effort at publicity by the university,” said Hele. Whitebean suggested the university can still improve with the implementation of a First Peoples House. She described this as a central space where the First Peoples Studies program could be potentially housed, along with an aboriginal student resource centre and a space for ceremony and other indigenous events. 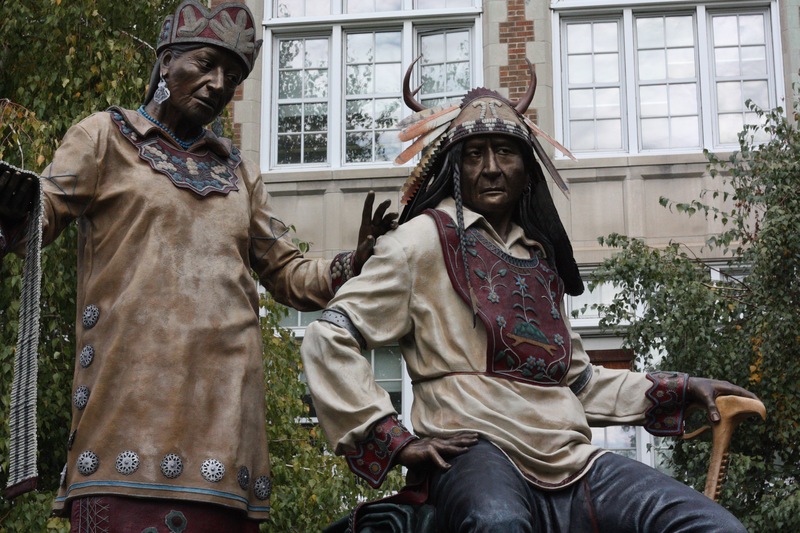 “Really, it marks a presence, acknowledgement and respect of first peoples and it’s a physical reminder for people on campus about the history, the [politics] and the people that the university occupies that space,” said Whitebean. She said McGill University already has a First Peoples House. In a CBC article, it was mentioned educators would be implementing the history of residential schools within high school curriculum, as per the TRC’s calls to action. “There’s huge movement in all the provinces and territories in the continued development of this curriculum around residential schools,” said Charlene Bearhead, education lead for the National Centre for Truth and Reconciliation (NCTR). “But also around the history and culture of First Nations and Inuit people.” Bearhead added the work involved in this initiative is ongoing. “There’s huge work being done across the country at the National Education Roundtable since then and, in fact, we’re planning for our second [roundtable] in January of this year,” said Bearhead. The National Education Roundtable is a gathering that discusses heritage preservation education and training in Canada. Bearhead identified the losses experienced by First Nations people as a result of residential schools including personality, knowledge, language and indigenous sciences. “Not only are indigenous people worse off for the loss of that knowledge, but all Canadians would benefit from those understandings,” said Bearhead. Bearhead said there is a gap in the involvement of indigenous people in society. “The gap isn’t in the people, the gap is in the system,” said Bearhead. She said education including an indigenous perspective will be more relevant, meaningful and useful to indigenous students if they actually can see themselves in the education. “How do students see education as valuable when they don’t even see themselves in it?” Bearhead questioned. Bearhead said indigenous students don’t see a reflection of themselves in their educators, worldviews, science, health, literature, music or art. “How is that different than residential schools? It’s still assimilation,” said Bearhead. Hele is skeptical as to whether the inclusion of indigenous history into the curriculum will extend beyond First Nations contribution to the fur trade. “I doubt it will do actually very much on aboriginal history,” said Hele. Hele said indigenous history should be taught in elementary schools. “It’s hard to teach the really rough history or rough politics.” However, he said there are certain parts of indigenous history which can be shared with elementary students. “Not everything in the past is negative,” said Hele. For example, he explained Kahnawake community members were great boatmen in the Montreal river over the Lachine Rapids—a series of rapids on the Saint Lawrence River—where these boatmen would cross to transport tons of goods. He said when the Lachine Canal was constructed, the industrial development of these canals ruined the industry for these communities. He said if some departments feel they cannot provide courses with content on indigenous peoples then they should require their students take an indigenous course outside of their discipline. “Indigenous studies is a growing field in education so I think it demonstrates that people are open to it,” said Whitebean. However, she said she believes there is caution needed in terms of respectfully approaching the issue. She said Canada is forced to implement the teaching of residential schools after the TRC calls to action, after the Canadian government issued a public apology in 2008 for residential schools. Whitebean said the educational system in Canada needs to have a more meaningful development towards this issue. *Onkwehón:we: is defined as the original, indigenous peoples, mainly of Turtle Island.